Stage 9 of this year’s Tour de France will go down as one of the most chaotic and exciting stages in recent times. With 22km of cobbles, it was always going to be an explosive day, and the favorites for the stage win did not disappoint. After a day fraught with crashes and flats, it came down to three of the best classics riders in the world sprinting for the win. German John Degenkolb took the victory; his first career Tour stage win, and an emotional comeback after a horrific crash in 2015. Never has teamwork been more critical than on stage 9 of this year’s TDF. The results reflect how much the GC leaders needed the help of teammates with classics racing experience, as those without clearly struggled to hold the pace and stay out of trouble. Luckily for Michelton-SCOTT GreenEdge’s Adam Yates, there are not many better or more experienced classics riders than Mathew Hayman. The 2016 Paris-Roubaix winner played a key role in helping Yates tackle the cobbles of Northern France, and we were lucky enough to get a look at his file from the day. 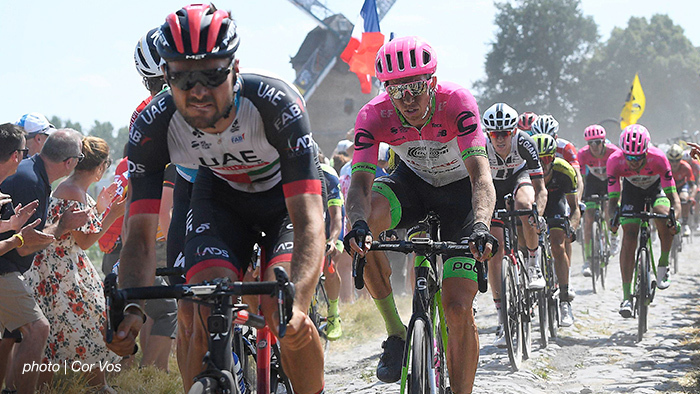 The race went off hard, as expected, and proved almost instantly dangerous, when pre-race favorite Richie Porte crashingz out of the race barely 10 kilometers from the start. During the opening 47km, which were cobble-free, we can see the speed was high as riders fought for a safe position. At this point Mathew averaged 250w, 3.02w/kg and normalized 303w, 3.74w/kg averaging just over 46kph. The tension continued to build all the way to the first sector, which started at the 47km mark; riders hit the cobbles at a bone-jiggling 55kph. After the stage, many riders said the pace prior to each sector was as hard as the cobbles themselves. With every team’s GC hopes on the line, jockeying would have been intense to stay ahead of the chaos sure to ensue in the group. The first big split happened with around 70km to go, with a large crash on sector 12 of the Pave. The peloton fractured into several groups here, and unfortunately Adam Yates found himself in the second bunch. You can see from the file that it was panic stations for the next 22km as Mathew and his teammates drove hard to bring Yates back to the front. Many of Mathew’s peak powers were completed during this fight to regain contact. 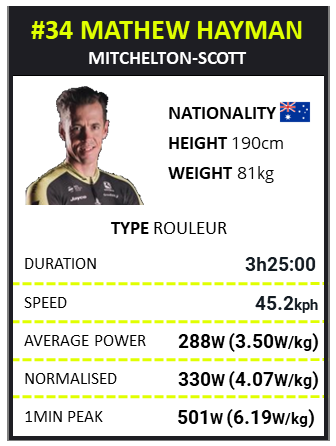 On the first sector after the split, for example, Mathew produced his peak 5min power of 400w, 4.8w/kg. But this doesn’t tell the full story—if we look a little closer we can see that during this 5 minute period Mathew pushed between 600w and 1232w, 13 times. He frequently hit between 7.5-15w/kg, which shows what it really takes to maintain full speed over the cobbles. Cobbles also present some unique physiological demands worth noting. When we compare a high intensity effort on a normal surface to the cobbles of Roubaix, we see massive differences in how force is applied. Riders must engage more muscle groups, and continuously adapt their posture/position on the bike. Worse, the consistent jarring takes a major toll on any hope of recovery. The ability to make these massive energy expenditures repeatedly (over the 15 sectors of cobbles) is what distinguishes classics riders from the rest of the peloton. The effort did not let up when the team finally rejoined the lead group, as they made contact just prior to one of the harshest sectors: Mons-en-Pevele. Over 900m of cobbles and one minute, Mathew produced 501w, 6.09w/kg to keep Yates with the leaders. This can’t have felt pleasant, as he had just chased for 22km at full gas to regain contact. Again, this shows that opportunities to recover, or find any sort of respite during this stage were very limited. The pace across many of the cobbled sectors continued, as crashes and attacks further split the groups. Some of the worst cobbled sectors came near the end of the stage, so it was no doubt an anxious time for Mathew and his colleagues to help Adam Yates navigate through the chaos. On the second-to-last cobbled sector, Camphin-en-Pevele, Mathew had to kick out 366w, 4.42w/kg for nearly 3min—but it must have been a relief to finish this sector with Yates safe, near the front, and with the end of the stage in sight. In the final 5km Mathew averaged 334w, 4.03w/kg for 6:26min. Yates finished 27th on the stage, and with the same time as Chris Froome (Sky) and Mikel Landa (Movistar), both strong GC favorites. Ultimately it was a successful, if challenging day for both Mathew and his team, and they’ll head into the mountains in a great position for an assault on the GC.